B.M. in Jazz Performance from Virginia Commonwealth University. Performance experience: Skip Gales, Larri Branch Agenda, John D'earth, J Smith Trio, Jeff Decker Quartet, Mcbeth, Mary and Tony Garcia, RVA Big Band, Narod, Suenos Guitanos, The Drifters, The Butterbean Jazz Quartet, Luray, Beast Wellington, Bob Blagg Trio, Jason Jenkins Trio, Charles Owens Trio, The Blue Tips, Nashville Avenue Stompers, Billy Evans, Jackie Frost Band, and many more. CJ has toured throughout the United States and has performed and recorded in Durban, South Africa and is featured on over 10 albums. 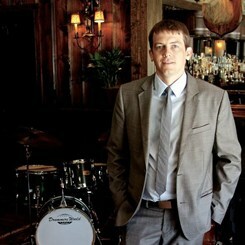 His drumming was recently featured on NPR's Mountain Stage with the group Luray. 7 years of teaching experience in all styles of music. Request Lessons with Charles today!